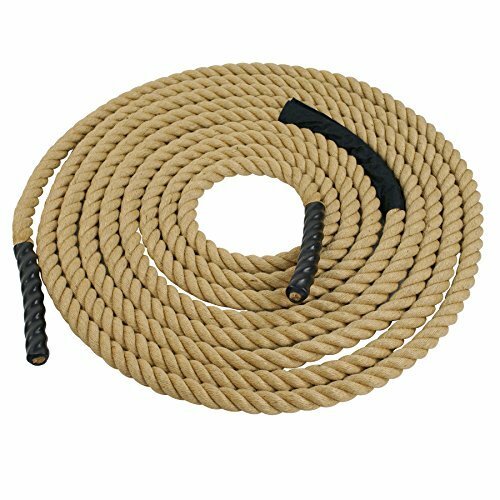 Strand Polypropylene Manila Rope - Great For Fitness, Nautical and Marine use, Decorative embellishment for landscaping or even around the ranch or farm! Resist temperature, weather, UV rays, chemicals, oils, and abrasions. Twisted polypro rope fibers are lightweight with a high-tensile strength for longer-lasting knots and performance. 3-Strand Polypropylene Rope also has excellent shock absorption and does not kink. ★ Super Deal Manila Rope is a stronger, synthetic version of the classic manila fiber. It is ideal for a wide range of indoor and outdoor applications. Such as nautical and marine use, around the ranch or farm, as a decorative embellishment for landscaping, or in a game of tug-o'-war! ★ Features Heat Shrink Caps on the ends to resist fray, wear and tear. Super High Tensile Strength. ★ The material is highly resistant to temperature, weather, UV rays, chemicals, oils, and abrasions. Twisted polypro rope fibers are lightweight with a high-tensile strength for longer-lasting knots and performance. ★ 3-Strand Polypropylene Rope also has excellent shock absorption and does not kink. ★ Perfect for any project: crafting, camping, hunting, construction, carpentry, freshwater and saltwater boating, fishing, and hundreds of other activities.